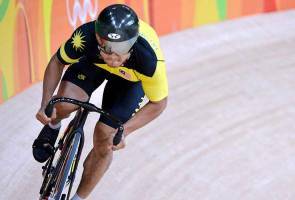 PUTRAJAYA: Prime Minister Datuk Seri Najib Tun Razak wants Keirin World Champion Azizulhasni Awang to be a role model in sports for the younger generation of Malaysians. He said it was hoped that Azizulhasni''s achievement would encourage other Malaysians to participate more actively in sports. "Hopefully, Azizulhasni will become an icon as he can speak well, has a pleasant personality and is a good person. "I am confident Azizulhasni will become a role model, especially for the younger generation," he said at the ceremony to present Azizulhasni a residential suite from Naza Corporation Holdings, at Seri Perdana here today. On the contribution from Naza Corporation Holdings, Najib said it was a token of appreciation from the corporate sector to Azizulhasni for bringing international glory to Malaysia in the field of sports. At the event, Najib presented Azizulhasni with a replica of the access card to the suite at Trion 888. Also present was Chairman of Naza TTDI Group SM Nasarudin SM Nasimuddin. The suite in Trion 888, priced at RM350,000 and located in Equine Park, Seri Kembangan, is part of a Naza TTDI Sdn Bhd project which is due to be completed by the end of this year. Gold medal winners at the Rio Paralympic Games 2016, Mohamad Ridzuan Mohamad Puzi, Muhammad Ziyad Zolkefli and Abdul Latif Romli were also rewarded with units at Trion 888. Azizulhasni, who had arrived from Melbourne, Australia, early today, thanked the Prime Minister and Naza Group for the appreciation. "I am very grateful. I was informed about this appreciation from the Prime Minister. I am very touched and happy. "I had mixed feelings when I found out that the Prime Minister would present me a suite on behalf of Naza. "I am emotional and, at the same time, very happy because we athletes who have worked hard all this time have never hoped for this kind of recognition," he said. He said it was not easy to reach the ranks of the elite in sports and there had been many sacrifices, including having to live in Melbourne for 10 years, leaving his family, including his parents, behind and spending his youth there. "What is important is that we get to inspire the younger generation in sports. "As a national sports icon, like other sports champions such as Datuk Lee Chong Wei and Datuk Nicol David, I want to continue inspiring the younger generation to be active in sports.